A revised draft of a romantic poem by William Wordsworth is to go on display. The Wordsworth Trust paid £9,000 for the copy of the White Doe of Rylstone, which contains amendments in the handwriting of the poet's wife, Mary. The rare draft shows how the poet, who was sensitive to criticism, constantly revised already published works. 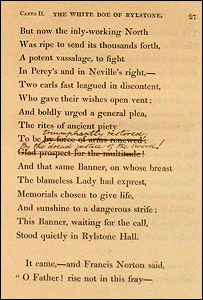 The poem, inspired by Wordsworth's visit to Bolton Abbey, was originally written in 1807/8 and revised for a second edition in 1820. The Wordsworth Trust and museum in Grasmere is dedicated to the work of the 19th Century poet and is beside his home, Dove Cottage. David Wilson, from the Trust, said: "The poem was held back from publication until 1815 because of Wordsworth's sensitivity to negative criticism he received when he showed it to Coleridge and Charles Lamb. "While that 1815 edition was still on sale, he revised it again for the 1820 edition. "It is those revisions that are written in the margins of this book and will provide researchers a better understanding of the poem." The Trust owns more than 90% of surviving Wordsworth manuscripts.